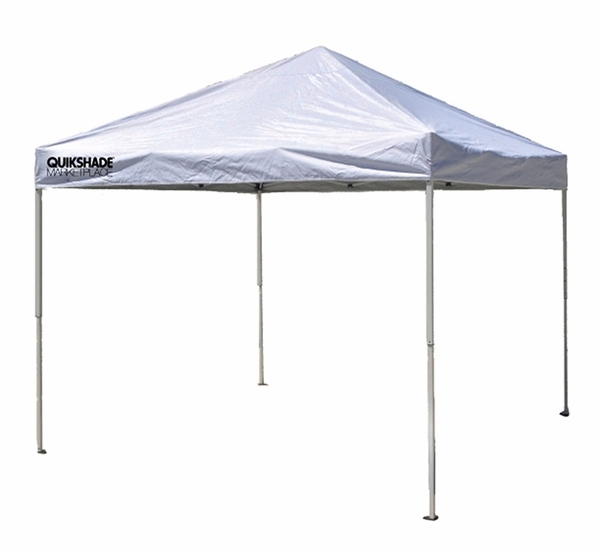 The Quik Shade Marketplace 10x10 Instant Canopy is the perfect canopy to use anywhere. Whether you're planning fun in the sun for a weekend getaway or a Saturday morning yard sale, this versatile canopy provides 100 square feet of shade with 99% UV protection, thanks to its durable Aluminex backed fabric. The patented leg sliders allow for three different height settings. There is also a removable wall panel to provide you with extra sun protection or privacy. It is easy to set up and comes fully assembled in a durable polyester wheeled bag to help you take it wherever your weekend takes you.